Milford Sound, New Zealand. Picture by Duncan McEwan. More than 100 guests from Morpeth Camera Club and other clubs, together with friends and the public enjoyed the annual ‘Big Event’, with international reputed photographer Duncan McEwan presenting two 45-minute shows of stunning images from a collection of landscape photographs of his Scottish homeland and overseas. Trotternish, Isle of Skye. Picture by Duncan McEwan. With his love of the unspoiled beauty and wilderness on his doorstep in Scotland, the first half of his presentation concentrated on off the beaten track images; atmospheric low cloud through mountains, vibrant marine colours of waters around Eigg, silhouetted deer in stark landscapes and heavily frosted trees reflected in lochs. 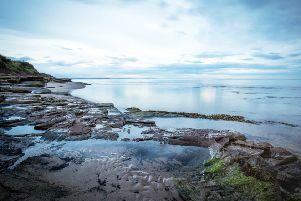 Preferring to maintain the reality of natural beauty, Duncan does not process his images aggressively, but uses filters to accent reflections and skies. The audience enjoyed stunning images of golden reflections of autumn foliage, richly patterned sand left by the receding tide, ridges of snow in evening light in hues of pinks and mauves, crystal globules of ice around reeds, sun rays through glens with billowing clouds, Hebridean crystal blue waters and sparkling sand and stormy seas off Orkney in magnificent aquamarines. Duncan stressed that with the use of a telephoto lens one can not only emphasise the grandeur of majestic mountains, but can also simplify the scene, producing pattern pictures and abstracts resembling the textures of fabrics. Flamingo flock at sunset, Nata, South Africa. Picture by Duncan McEwan. Dull weather does not deter him, explaining that rain enhances rock colours and a breeze gives texture to water. He said that midday light should be enjoyed as it highlights texture and colour, and not to shy away from low light, which emphasises light and shadow on hills. A beautiful dash of winter sun adds warmth to snow scenes and captures the glow of evening light. Throughout his presentation Duncan explained his methods of carefully composing key elements, choosing the best viewpoint for balance, while maintaining foreground interest to create maximum impact. An interval followed when drinks and refreshments were served, giving the audience an opportunity to enjoy an exhibition of photographs taken by club members. In the second half of his presentation, entitled Further Afield, Duncan explained that he didn’t venture abroad until 2005, his first trip being to New Zealand. Evening, Laig Bay, Isle of Eigg. Picture by Duncan McEwan. This was a home from home for him in terms of landscape, but with larger mountains and lakes. He showed sulphurous smoking images of mud explosions of the geo-thermal region of Rotorua, snow and ice on the high peaks of Aoraki and Mount Cook, blue ice caves forming abstract shapes, and the dramatic Moeraki spherical boulders contrasting with silver birch in abstract form. There were moody images of Milford Sound in low cloud reflected in the fiord. This was a marvellous country that Duncan would not hesitate to revisit. There were dramatic photographs taken on the Great Ocean Road in Australia, with images of cliffs, pinnacles side lit to emphasise relief and textures, and pounding waves. Snow white undulating desert sands in South Africa, abandoned mining towns with images of derelect interiors and rusty old cars, lions with their prey, leopards in grasses, elephant and young, the Cape Peninsula penguins and seabirds on a glacier, and flamingos set against a pink setting sun emphasised the amazing contrast in subject matter captured so beautifully. Duncan McEwan presenting two 45-minute shows of stunning images from a collection of landscape photographs of his Scottish homeland and overseas. The glorious architecture of the Taj Mahal, forts and temples, its market traders in the spice market in vibrant colours, happy children in sparkling white school uniforms, busy street scenes, beggars, all unposed and natural portrayed life in this colourful country. Illustrating his obvious passion for his craft Duncan’s presentation was an amazing journey through his beloved highlands of Scotland, his story telling colourful images of further afield held the audience spellbound, resulting in a very memorable evening.